A 3 Phase 400v Direct On-Line pump controller with on-demand activation from 2 inputs (float switch or pressure switch),manual override and long range remote operation options for commercial and industrial environments. Note – Many 400v controllers actually need a 230v supply as well (3P+N+PE), this controller only requires 400v (3P+PE) and can be retro-fitted where no neutral phase may be readily available. 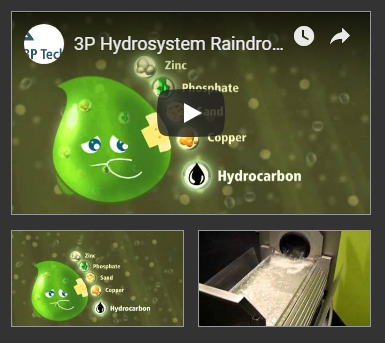 Suitable for drainage, tank transfer, drawing water from boreholes, streams and watercourses, and pressure boosting applications. Controls a single three-phase pump at 400vac via Direct-On Line (DOL) starting. Dual pump and star-delta versions are also available. Thermal overload protection provides standard protection against seizure and motor failure. Voltage and phase monitoring provide enhanced protection for generators and temporary/remote installations . Optional undercurrent protection provides dry run protection in situations where a float switch or other level switch is not possible. Low voltage sensor operation accommodates various level switch types including floats, reed switches, vibrating fork, optical, ultrasonic and other electronic types with switching capacity of 1A@24v or greater. All devices on the front panel are run at 24v for enhanced operator safety. The optional GSM control module allows the pump set to be enabled/disabled via mobile phone and alerts up to 5 mobile phones if a fault occurs. The optional remote control panel connected by VHF radio link provides a wireless remote control panel at ranges of up to 16km with duplication of lights and relocation of the control switch to the remote panel. Remote panels are built to order and may control up to 64 PC3S systems from a single panel. Undercurrent Protection – Detects reduced current caused by dry-running and shuts the system down to prevent damage. Scheduling Timer – Program the control panel to operate only at preset times during a 7 day cycle. GSM Control – Enable/Inhibit the system and receive fault alerts via text message. 1km VHF Radio Remote Panel – Duplicates display panel lights and optionally relocates the control switch to the remote panel. Operates via a radio link with a maximum range of 1km. 16km VHF Radio Remote Panel – As 1km radio but with increased range to 16km. 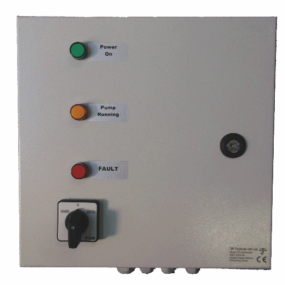 Safe 24 volt operation of external float switches and front panel controls/lamps.